What’s A Goya Like You Doing In A Place Like This? Just as you wouldn’t make a pilgrimage to Butte, Montana, in search of a good seafood restaurant, you probably wouldn’t expect to find a good art museum in Fort Worth, Texas. I haven’t sampled the flounder in Butte, but — surprise! — the art museum in Fort Worth is a gem. Kahn’s building for the Kimbell is attractive, if not on the grand scale of the Metropolitan or the Louvre or the Getty. It doesn’t need to be huge, because the Kimbell houses less than 350 permanent works. The directors made a decision prior to the museum’s opening in 1972 that they would leave to the aristocratic museums the task of collecting broadly and in depth; they defined the Kimbell’s “primary collecting aspiration the pursuit of quality over quantity”. As a result, the Kimbell has assembled an all-star team: Velázquez, Rembrandt, Cézanne, Titian, Goya, Monet, Bernini, Caravaggio. Many other masters are represented here as well, usually by only one or two of their works. 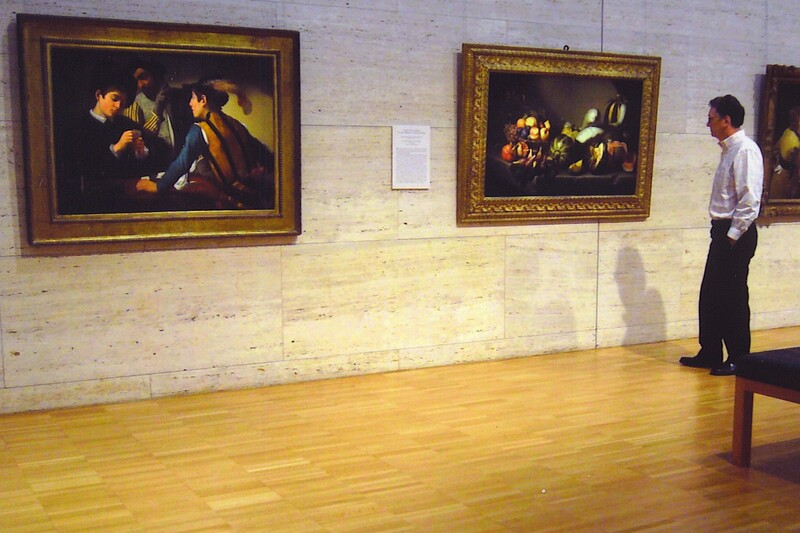 It should be noted that in most cases, what the Kimbell holds is not one of the artist’s true masterpieces (although Caravaggio’s “Card Sharps” is a notable exception). Rather, the works are representative of each artist, supplying a sort of sampler: Canaletto painted Venetian landscapes; “I’ll be darned, here’s one now.” The main focus is on European artists, but the Kimbell also displays pieces from Egyptian, Greek and Roman antiquity. American art is absent, since a neighboring museum houses that; that’s also the case with art works created since the mid-20th century. You won’t find several rooms filled with paintings by Rembrandt here, as at the Rijksmuseum in Amsterdam. There is no “Mona Lisa” in the Kimbell. There are also no jostling crowds fighting for position in front of a celebrity painting and then dashing off to the next one. Instead, there is something close to solitude in the Kimbell (at least, the day we were there). It’s possible to stand before an art work for as long as you want without distraction. Take your time studying it, admiring it. And if you eventually become sated with fine art, one of the city’s other major attractions is only a couple of blocks away: The National Cowgirl Museum and Hall of Fame. You’re not surprised that’s in Fort Worth, Texas, are you? This entry was posted in Art, Travel and tagged Caravaggio, Kimbell Art Museum. Bookmark the permalink.